Bowl, cupped, Egyptian Lustre (black) (3 1/2-inch base, 5 5/8-inch wide). 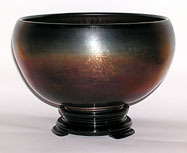 Bowl, flared, in Egyptian Lustre (black) (3 1/2-inch base, 7 7/8-inch wide). Bowl, flared, cupped, in Egyptian Lustre (black) (3 1/2-inch base, 7 5/8-inch wide). Bowl, cupped, in Egyptian Lustre (black) (2 7/8-inch base, 7 1/4--inch wide). Bowl, flared, cupped, Egyptian Lustre (black) (2 7/8-inch base, 8 1/2-inch wide). Bowl, cupped, in Blue (3 3/4-inch base, 8 1/4-inch wide). Bowl, raised cupped, in Egyptian Lustre (black) (3 3/4-inch base, 7 1/2-inch wide). Bowl, flared, in Blue Crackle (cobalt blue crackle glass) (3 3/4-inch base, 10-inch wide). Bowl, flared (45-degree), in Blue (4 3/8-inch base, 9 3/4-inch wide). Lancaster made a very similar bowl, but those are usually marigold. 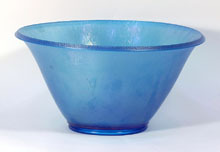 Bowl, crimped in Blue (5 1/2-inch base, 7 1/2-inch wide). Bowl, low, cupped, in Blue (5 3/8-inch base, 7-inch wide). 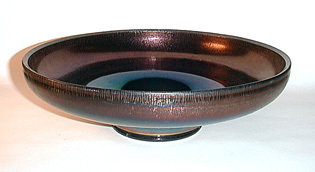 Bowl, low cupped, in topaz (7-inch base, 8 1/4-inch wide). Bowl, 3-footed, raised cupped, in Blue (ground marie base, 7 3/8-inch wide). Bowl, 3-footed, low cupped, in Egyptian Lustre (ground marie base, 8 1/2-inch wide). Bowl, low flared, in Egyptian Lustre (black) (8 3/4-inch base, 12 1/4-inch wide). Bowl, low cupped, in Midnight Wisteria (dark purple) (8 1/2-inch base, 10 3/8-inch wide). Bowl, low raised, flared, in Egyptian Lustre (black) with enamel decoration (8 3/4-inch base, 14-inch wide). Bowl, blown molded, rolled rim in Egyptian Lustre (black) and gold decoration (5 3/8-inch base, 9 1/8-inch wide). Bowl, blown molded, flat rim, in Egyptian Lustre (black) and gold decoration (6 1/4-inch base, 10 7/8-inch wide). 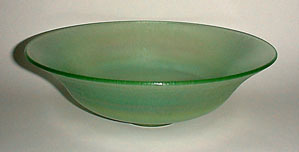 Bowl, low cupped, in Green (3 7/8-inch base; 14-inch wide). Bowl, raised cupped, in Egyptian Lustre (black) (3 7/8-inch base; 10 1/4-inch wide). Bowl, flared, in green (3-inch ground base, 12-inch wide). 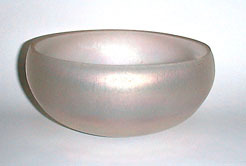 Bowl, cupped, in crystal (3-inch ground base, 9 1/2-inch wide). Bowl, punch (flared), in Egyptian Lustre (black) (3 3/7-inch base, 12 1/4-inch wide, 5 1/2-inch tall). Bowl, raised flared, in Blue (5-inch base, 12-inch diameter). Bowl, low cupped, in Egyptian Lustre (black) (5-inch base, 14-inch diameter). Bowl, flared with optic rays, in Blue Crackle (6 1/2-inch base, 15 3/4-inch wide).